Netto K, Hampson G, Oppermann B, Carstairs G, Aisbett B. To examine the type and effectiveness of various strategies used by Royal Australian Air Force (RAAF) fast jet (FJ) aircrew in self-referral and management of flight-related neck pain, a 6–section, 18–question survey tool was distributed to 86 eligible RAAF aircrew. Selective results from the sections evaluating aircrew demographics, incidence of flight-related neck pain, and the self-referral strategies of aircrew to manage these injuries are presented here. Eighty-two RAAF FJ aircrew responded to the survey. Ninety-five percent of the respondents experienced flight-related neck pain. The most commonly sought treatment modalities were on-base medical and physiotherapy services. Many respondents reported that currently provided on-base treatment and ancillary services such as chiropractic therapy are the most effective in alleviating symptoms. Further investigation into the effectiveness and safety of these ancillary therapies needs to be performed to allow appropriate consideration of their place in the management of neck pain in FJ aircrew. Military aircrew who fly modern, high performance combat aircraft, commonly termed fast jet (FJ) aircrew, routinely operate in altered lateral and gravitational force (Gz) environment, a result of accelerating (+Gz) and decelerating (–Gz) manoeuvres in aerial combat. In this physically demanding environment, FJ aircrew are expected to perform difficult motor tasks and process complex cognitive information. The underlying mechanism of neck pain in FJ aircrew has been attributed to a combination of an altered Gz environment, inadequacies of human neck to tolerate these high loads, and adopting head postures that are injurious during aerial combat manoeuvres. [8, 9] Although strategies including preflight stretching,  in-flight bracing,  and neck strengthening exercises [1, 10] have been suggested to possibly prevent neck pain in FJ aircrew, few studies have evaluated the effectiveness of these preventative strategies on reducing the incidence and severity of flight-related neck pain. Little is known about the effective management and rehabilitation of neck pain in FJ aircrew. Injury management and rehabilitative strategies are, however, well researched in other forms of neck pain and injury including chronic neck pain and whiplash-like disorders. [11, 12] In Australia, the Military Rehabilitation and Compensation Act  legislates that the aim of rehabilitation of injured military personnel is to “maximize the potential to restore a person who has an impairment, or an incapacity for service or work, as a result of a service injury or disease to at least the same physical and psychological state, and at least the same social, vocational, and educational status, as he or she had before the injury.” The methods by which RAAF FJ aircrew manage or rehabilitate their flight-related neck pain or the effectiveness of these strategies are unquantified. As such, the aim of this report is to document the strategies used by RAAF FJ aircrew to manage and rehabilitate flight-related neck pain. This report used selective questions from a larger survey of flight-related neck pain in RAAF FJ aircrew to describe and quantify pain management strategies used by respondents. The larger survey comprised an anonymous questionnaire of flightrelated neck pain, and this was circulated to 86 eligible RAAF FJ aircrew currently posted within RAAF Air Combat Group. Ethical approval for the larger survey study was obtained from the Australian Defence Force Human Research Ethics Committee and the Deakin University Human Research Ethics Committee, and informed consent of all participants in the study was obtained before the commencement of the survey. The questionnaires were distributed following a briefi ng on the intent of the project by a member of the investigating team. To be eligible to enter this study, participants had to be a current permanent or reserve RAAF FJ aircrew either presently or previously qualified on a high-performance aircraft. Student FJ aircrew undergoing a conversion course onto a high-performance airframe were also eligible. Personnel on exchange from foreign military organizations were excluded from this study. The survey tool comprised 18 questions and was divided into 6 sections. These sections broadly surveyed personal details and flying experience (section 1), usage of helmets and night vision goggles/helmet-mounted display systems (section 2), preventative activities whilst flying to minimize the risk of neck pain and injury (section 3), neck strain, pain, or injury sustained (section 4), neck pain management (section 5), and neck pain prevention (section 6). As the aim of this report was to document the strategies used by FJ aircrew to manage their neck pain, only the results from sections 1 and 4 of the survey are pertinent to this report and these sections will be described in detail. Section 1 of the survey queried general information of the FJ aircrew including selfreported anthropometry, flying history in hours, and the type of aircraft in which this experience was gained. Section 4 of the survey assessed neck strain, pain, or injury experienced by RAAF FJ aircrew. This section queried the existence of flightrelated neck pain, the severity of such pain on a visual analogue scale of 0 (no pain) to 10 (worst possible pain), and the duration of the pain experienced post-flight. Both the level of pain severity and duration were surveyed for the worst episode of flight-related neck pain and the average episode of flightrelated neck pain experienced by the participant. Information regarding FJ aircrew being temporarily medically unfi t for flying (TMUFF) due to flight-related neck pain was also gathered. The section then queried the management strategies used by FJ aircrew for the neck pain including how quickly treatment was sought, where the treatment was sought, delays in accessing treatment, and finally, the effectiveness of treatments used. Results from the survey tool were collated in Microsoft Excel 2007 (Microsoft Corporation, Redmond, WA). Anthropometric and flying experience data were averaged to obtain mean and standard deviation (SD) results. Flight-related neck pain and TMUFF rates were expressed as percentages of the total surveyed population. Neck pain severity from the visual analog scale and neck pain durations were pooled to obtain mean and SD results of the pain-affected group of FJ aircrew. Because many respondents to the survey listed more than one form of treatment as the management strategy and their most and least effective form of treatment, these data were tallied to form total counts per treatment modality and subsequently expressed as a percentage of the total count. Eighty-two RAAF FJ aircrew responded to the survey (response rate, 95%). The average age, height, and weight of the respondents were (±SD) 31 ± 7.4 years, 180.6 ± 6.5 cm, and 81.1 ± 8.6 kg, respectively. Their average total flying hours were 2,013 ± 1,570 hours, with average total jet hours of 854 ± 618 hours over the last 10 years. Of the 82 aircrew who responded to the survey, 78 (95%) had experienced flight-related neck pain during or after flight. 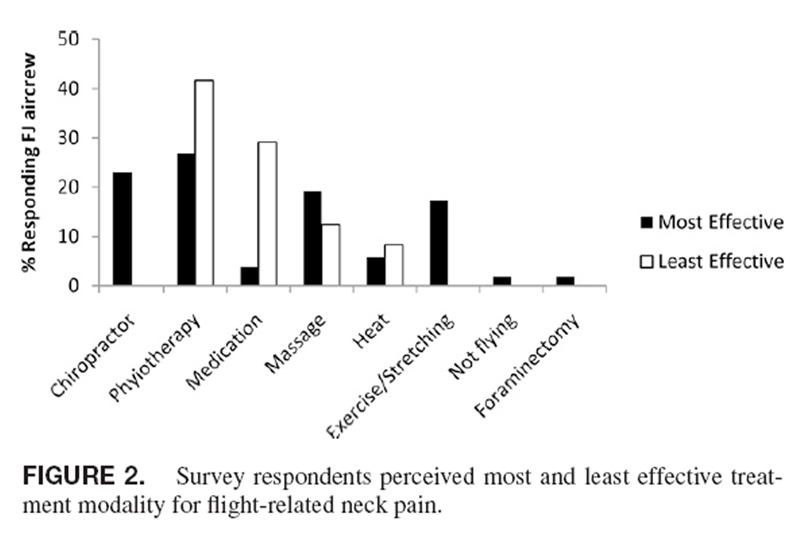 The severity of the worst episode of neck pain experienced by the respondents was reported as being 5.5 ± 2.3 while flying and 5.0 ± 2.1 after flying (0 = no pain, 10 = worst possible pain). The majority of the injured FJ aircrew experienced this pain (worst) for 1–4 days (33%) or more than 4 days (36%) post-flight. The average pain severity experienced by the respondents was reported as being 4.0 ± 1.8 while flying and 3.8 ± 2.0 after flying. Most of the injured FJ aircrew reported experiencing this pain (average) for 1–4 days (38%) post-flight. As a result of flight-related neck pain, 34 (42%) of the respondents had been assessed TMUFF during their flying career. Of these, 4 (12%) were TMUFF for 3–4 weeks, 6 (18%) were TMUFF for 1–2 weeks, and 24 (70%) were TMUFF for less than a week. Of the 78 FJ aircrew who had experienced flight-related neck pain, 55% (43) sought treatment for the pain. Only 9 (20%) FJ aircrew reported postponing seeking treatment after the pain occurred. Most aircrew experienced no delay (17%) or delays of less than 1 week (74%) in obtaining treatment for neck pain once the initial consultation was sought. Only 4 FJ aircrew (9%) reported a delay of more than a week in obtaining treatment after initial consultation. The most commonly used treatments were physiotherapy (35%) and medical consultation (25%) and the least common were remedial massage (12%) and self-medication (10%; Figure 1). Of the 43 FJ aircrew who sought treatment for neck pain, 42 listed their most effective treatments in alleviating the pain and 23 described the least effective form of treatment they had used. Physiotherapy was rated by the responding FJ aircrew as being the most effective (27%) as well as the least effective (42%) form of treatment. Chiropractic treatment, exercise/ stretching, and massage were also reported as being effective in the management of flight-related neck pain (Figure 2). This study aimed to quantify the treatment strategies used by injured RAAF FJ aircrew in the management and rehabilitation of flight-related neck pain. A large percentage (95%) of this occupational population suffers from flight-related neck pain and approximately half (55%) seeks treatment for this condition. The treatment options used by the survey respondents and the reported effectiveness of those treatments were varied. The incidence of flight-related neck pain reported in this study is similar to other reports of military aircrew around the world. 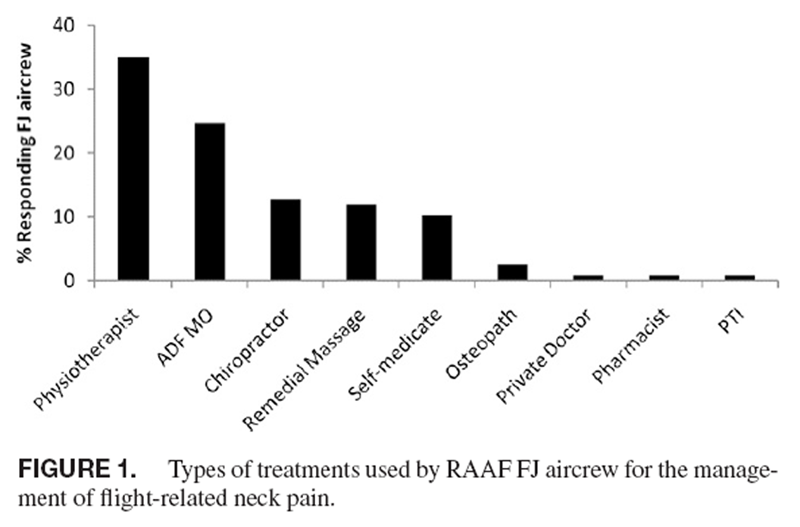 [1, 3, 9] On-base physiotherapy (35%) and medical (25%) services were the most commonly sought treatments for flightrelated neck pain amongst the aircrew surveyed. These results can in part be explained by the current health service delivery model used in the RAAF. Injured FJ aircrew generally self-evaluate their neck pain and consult with an on-base Aviation Medical Officer (AVMO) if they feel the pain to be severe enough. On major bases in Australia, they may also go directly to on-base physiotherapy services. The AVMO and physiotherapist assess the injury and initiate management, including referral as required. Typically, the management includes physiotherapy. The AVMO then considers the aero-medical disposition of the FJ aircrew member after treatment. When treatment modalities were compared for their effectiveness, the results were similar. Injured FJ aircrew found physiotherapy and chiropractic treatment to be effective in treating flight-related neck pain. Manipulation and mobilization of the neck by these therapists have been shown to be effective in providing immediate or short-term relief to the neck pain sufferer in the general population. Currently, the RAAF only provides physiotherapy as part of its on-base health service delivery model although ancillary treatments such as chiropractic are accessed on a case-by-case basis usually after the failure of on-base services to alleviate symptoms. More investigation needs to be carried out to directly evaluate the usefulness and safety of these treatments in this specifi c occupational population. Exercise and stretching were reported by a number of injured FJ aircrew to be effective in the management of flightrelated neck pain. This modality has also been advocated by other researchers as a possible preventative measure against flight-related neck pain. [1, 10] Further, there is some evidence that exercise is a successful treatment modality of mechanical neck disorders in civilian populations both in the short term and in the long term. When exercise is combined with other modalities of treatment such as mobilization and manipulation, there is strong evidence of benefi t to the neck pain sufferer. [13, 14] The RAAF is committed to enhancing FJ aircrew health and performance through preventative measures and prompt effective treatment. Future study should focus on the design, implementation, uptake, effectiveness, and safety of a specifi cally designed exercise program for the prevention and rehabilitation of flight-related neck pain in FJ aircrew. The results of this survey show that flight-related neck pain is a perennial occupational hazard among FJ aircrew in Australia, as elsewhere. A wide variety of treatments are used by injured FJ aircrew, with on-base physiotherapy and medical treatment being the most common forms. Ancillary treatments, such as chiropractic therapy are only accessible on a case-by-case basis under the RAAF health service delivery model, even though they were reported by some respondents as being the most effective form of management. More investigation into the effectiveness and safety of these ancillary therapies needs to be performed to allow appropriate consideration of their place in the management of neck pain in FJ aircrew. Prevention and the effective management of neck pain in FJ aircrew would improve the air combat capability and maintain the health of aircrew, worldwide. This study was conducted by the RAAF Institute of Aviation medicine and supported by Joint Health Command, Aerospace Operational Support Group, and Air Combat Group. Human and behavioural factors contributing to spine-based neurological cockpit injuries in pilots of high-performance aircraft: recommendations for management and prevention . Mil Med 2000 ; 165: 6 – 12 . Head position for high +Gz loads: an analysis of the techniques used by F/A-18 pilots . Aviat Space Environ Med 1997 ; 68: 732 – 5 . Spinal symtoms in aviators and their relationship to G-exposure and aircraft seating angle . Aviat Space Environ Med 2000 ; 71: 22 – 30 . Effect of GZ forces and head movements on cervical erector spinae muscle strain . Aviat Space Environ Med 1992 ; 63: 709 – 16 . +GZ-associated stenosis of the cervical spinal canal in fi ghter pilots . Aviat Space Environ Med 1999 ; 70: 330 – 4 . Degenerative changes of the spine of fi ghter pilots of the Royal Netherlands Air Force (RNLAF) . Aviat Space Environ Med 1999 ; 70: 1057 – 63 . Neck injury sustained during exposure to high-G forces in the F-16 B .
Aviat Space Environ Med 1988 ; 59: 356 – 8 . Neck muscle activation and head postures in common high performance aerial combat manoeuvres . Aviat Space Environ Med 2006 ; 77: 1049 – 55 . Head positioning and neck muscle activation during air combat . Aviat Space Environ Med 2004 ; 75 : 676 – 80 . Neck exercises compared to muscle activation during aerial combat maneuvers . Aviat Space Environ Med 2007 ; 78: 478 – 84 . Manipulation or mobilisation for neck pain . Cochrane Database Syst Rev 2010 ; (1) : CD004249 . Cervical Overview Group, et al: Exercises for mechanical neck disorders . Cochrane Database Syst Rev 2005 ; 3: CD004250 . Commonwealth Government of Australia . Military Rehabilitation and Compensation Act . Act No . 51 (2004) . Preventive interventions for back and neck pain problems: what is the evidence? [Review] .